President Donald Trump’s administration wants to agree a “cutting edge” free trade agreement with the United Kingdom “as soon as it is ready” after leaving the European Union, the U.S.’s chief trade negotiator has said. In a letter to Congress on Tuesday, Trade Representative Robert Lighthizer said that the U.S. will be “well prepared” to begin negotiations on a “broad and deep trade and investment relationship”. “The United States and the United Kingdom are the first and fifth largest economies in the world, respectively, and maintain a broad and deep trade and investment relationship. “An ambitious trade agreement between our two countries could further expand this relationship by removing existing goods and services tariff and non-tariff trade barriers and by developing cutting-edge obligations for emerging sectors where US and UK innovators and entrepreneurs are most competitive,” Mr Lighthizer wrote. Acknowledging that the UK is hamstrung in negotiations whilst still tied to the EU, the U.S. trade representative noted that he and British international trade secretary Liam Fox had been collaborating on laying the groundwork for a “potential future free trade agreement so that we will be well prepared to begin negotiations once the United Kingdom has formally exited the European Union”. This communication represents a concrete statement of intent by the Trump administration to progress on a bilateral trade deal that has long been pledged by the President and his envoys since he took office. A successful free trade agreement with the U.S. remains key for the UK as she leaves the bloc; but the Brexit process continuing at a slow pace for more than two years after the June 2016 vote — coupled with Prime Minister Theresa May’s proposal over the summer for a soft Brexit — threatens to throw the future of a U.S. trade deal into doubt. Leaving the UK tied to some EU institutions, as May’s Chequers plan proposes, “will probably kill” a bilateral trade deal with the U.S., President Trump said in an interview in July ahead of his UK visit. He also criticised Prime Minister May for ignoring his advice on dealing with the bloc, which is currently hardening its negotiating position in hopes of May making further concessions. 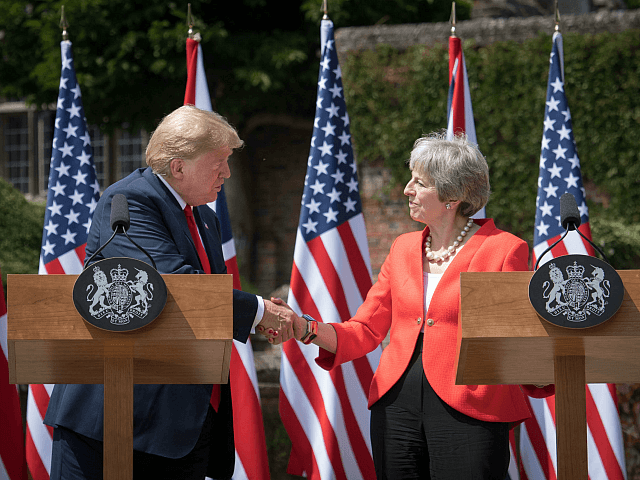 However, days later the President assured the UK he would sign a “tremendously big” trade deal between the U.S. and UK after Brexit — despite May’s previous scolding of the President, including criticising his immigration and border policies. International trade secretary Liam Fox is expected to debunk scare stories in a speech Wednesday night that a bilateral UK-U.S. deal would result in a slashing of animal welfare rules and insects in chocolate, after histrionic reactions from Europhile Remainers to the prospect of a free trade deal with the world’s largest economy.